Contamination from misapplied dicamba-based herbicide in the center rows of a soybean field, compared to healthier plants on either side. Normally, Story County, Iowa, soybean farmer Kevin Larson said, he would resolve a dispute with a neighbor privately. Instead, he went to the Iowa Pesticide Bureau in 2017 when he suspected a powerful herbicide drifting from a nearby farm damaged his crop. Other soybean farmers IowaWatch spoke with in Iowa are doing that, too. They increasingly are filing complaints with the state’s Pesticide Bureau about drifting herbicides, some with hopes of securing tighter regulations of powerful weed killers containing dicamba. “That’s the only way to get them to listen to you,” Larson, who farms near Story City, said. The state and federal government have not implemented the temperature and date cut-offs for dicamba application that some farmers believe are necessary to reduce drift damage. Rather, state guidelines require applicators to follow the existing instructions on pesticide container labels, which are regulated by the U.S. Environmental Protection Agency. With the introduction of new dicamba-based herbicides in 2017, the Iowa Pesticide Bureau reported a 69.7 percent increase in complaints about the pesticide drifting from 2016 to 2017, and a 2 percent increase from 2017 to 2018. Dicamba is the active ingredient in a variety of name brand herbicides, notably Engenia and Xtendimax. Dicamba drift has been a concern since the first dicamba herbicide was registered for use in the United States in 1967. 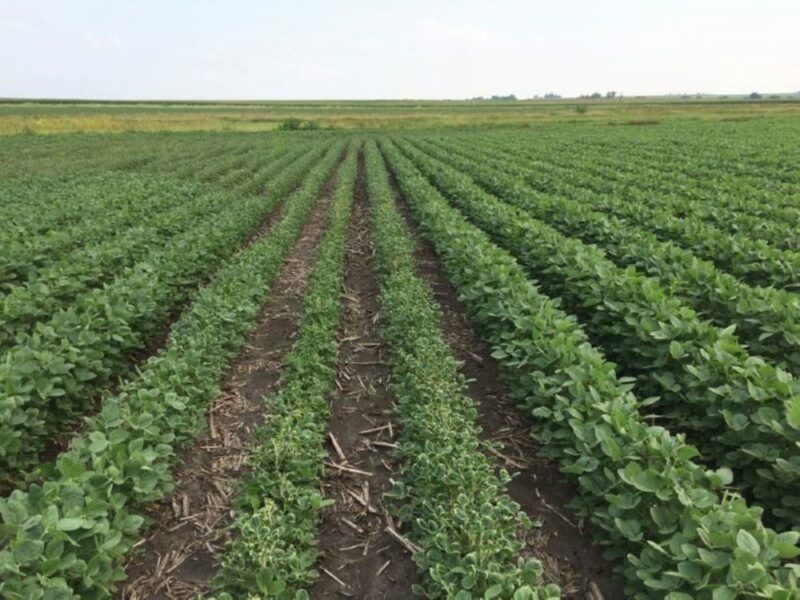 Despite dicamba’s volatility, the EPA has approved three new dicamba formulas — BASF’s Engenia, DowDuPont’s FeXapan, and Monsanto’s Xtendimax — for use in the 2017, 2018, 2019 and 2020 growing seasons. But an Iowa State University extension officer who assessed the damaged soybeans said drift from Monsanto’s herbicide was at fault, Larson said. The officer called Monsanto, he said. “And not 20 minutes after that Monsanto was on the phone with us offering to make a settlement,” Larson said. Larson said his son reached a private settlement with Monsanto, but that he was unable to disclose details because of a non-disclosure agreement that was part of the settlement. Instructions for applying dicamba direct applicators to spray it in June and July. Larson said spraying in the spring is less harmful because drift is more likely in the warmer summer months. 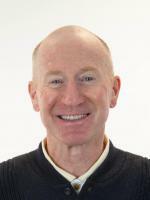 “That’s what differentiates dicamba from other products. If you do a good job in paying attention to the environment and adjust your sprayer right there’s minimal risk of problems, but with dicamba a person would do everything right … and still have problems,” Hartzler said. “If it wouldn’t have been dicamba, I wouldn’t have done it,” Hibma, whose farm is near Harris by the Minnesota border with Iowa, said. Much of the spraying in Iowa in the last two years has been done by professionally trained applicators. “This training is separate and distinct from the pesticide applicator continuing instruction courses required by the U.S. Environmental Protection Agency (EPA),” Coppess wrote in an email to IowaWatch. Hartzler and ISU Extension and Outreach’s weed management specialist Kristine Schaefer helped the state ag department develop the new dicamba training curriculum. “IDALS believes these changes adequately address drift concerns while giving farmers access to a variety of weed-control solutions,” Coppess wrote. Hartzler has advocated for a mid-June cut-off on dicamba applications. Larson went a step further. He said the state or federal government should not allow the use of dicamba because it’s so prone to drift. 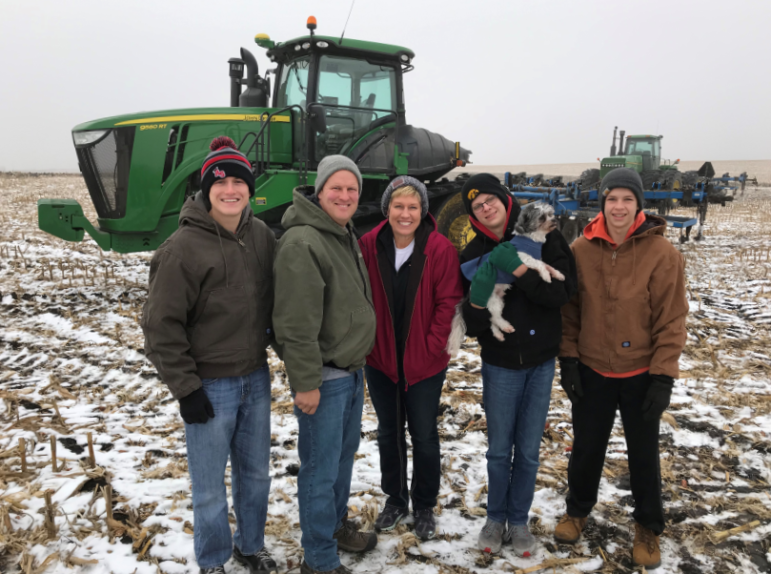 Tony Blue and his family at their farm near Kamrar, Iowa. Left to right: stepson Eric Dowe, Blue, wife Christine Semler-Blue, sons Connor Blue (holding family dog, Duke) and Tanner Blue. Blue said he filed his 2017 complaint because it was the first time he had severe problems with the powerful herbicide drifting from a neighbor’s field. Blue said five of his soybean fields sustained considerable damage so he turned to the Pesticide Bureau for help. The applicator in his case received a warning, bureau records show. This story republished by The Des Moines Register under IowaWatch’s mission of sharing stories with media partners. When it comes to pesticides — including insecticides, herbicides and fungicides — in Wisconsin’s drinking water, the Wisconsin Center for Investigative Journalism found several health concerns in this investigation.